For your entry, your child needs to draw or create a picture showing what their favourite food is and there are a few other terms outlined too. I used Claire's suggestion of doing a plate outline for him to use - and he's filled it in with wax crayons, pencil crayons, paint pens and glitter glue he took an awful lot of time picking out what to do and was able to explain bits - yellow cheese, red tomato sauce, green veg - but I'm not sure what the blue, (or glittery) bits are supposed to be - I'm guessing Blueberries - he has a current thing for them. I think you will agree that this is pretty awesome work by a chicken pox ridden two (and a half) year old - but I guess all mums think their kids art work is the bees knees! If he's a winner - he's going to buy that dinosaur toy and something for his baby sister, Maegan too! The Competition is open until 6th feb and the winner wins a generous £100 Amazon voucher! - Think you can take on Blake's entry? 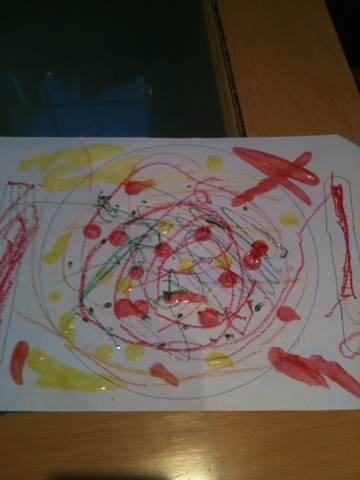 Pizza - an Art interpretation by Blake aged 2. Wohoo! Blake won! - absolutely the worlds most proud mummy right now!! !